Deputies of ACUM bloc and its supporters gathered in front of Parliament, before the inaugural meeting of the 10th Legislature. People were called to join the protest. Protesters didn't stop insults and allegations against colleagues in Parliament, the press and policemen who ensured the public order. 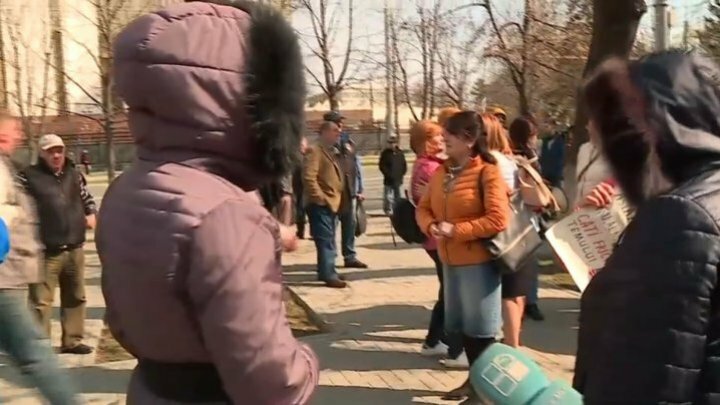 "We are here to see how the fate of the country will be decided", a woman said. Some protesters refused to say why they joined the protest and insulted the Publika TV team. -Anyone who wants to join us, remain here, otherwise in the rubbish. -We don't talk with you. Stay away. Some deputies of ACUM bloc and other protesters had undignified language and behavior. "In the next four years, nobody will be safe, neither the activists, nor the journalists, nor the socialists", said Alexandru Slusari, deputy of ACUM bloc. One of the leaders of the extremist organization Antifa, the recidivist Pavel Grigorciuc, participated in the demonstration. "We don't like this. Leave the protest and start working, to carry on". New head of PDM faction in Parliament, Pavel Filip, came up with advice for ACUM bloc. "Protests are absolutely democratic way of attracting attention to problems or others. But problems are not solved on the street. Problems can be solved through discussion", said Pavel Filip. According to the police, around 150 people participated in the demonstration.